Researching some of the settings in my book, Bokassa’s Last Apostle, for a planned series of filmed readings, I googled ‘Kudos’, only to find the first hit said ‘Kudos-closed’! Further down the search results I found another entry, stating it had changed to ‘Gilberts Bar’. I visited it on Sunday and the reality is even worse. Whatever it had become, it is now very obviously CLOSED! Asking around at Halfway to Heaven, the nearest gay bar, the barman had no idea what had become of it. I finally got an answer at Old Comptons. It had been off the gaydar ‘for years’. 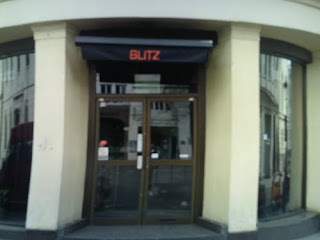 It has clearly been rebranded at least once after becoming ‘Gilberts’, as the building had a sign saying Blitz on the front. Peeking through the door, the inside looked like a bomb had hit it. (update) I just found another reference to Kudos saying it opened as ‘Blitz’, a ‘gay/mixed’ bar/club on 3 Feb 2012. AND I then looked up the back issues online of QX, who carried an entry on ‘Blitz’ opening night on Feb 3rd. Here's a link to an article about it: http://www.blitzbar.co.uk/2012/01/26/press-qx-interview-january-2012/ Well, it obviously didn’t work out. What a shame! 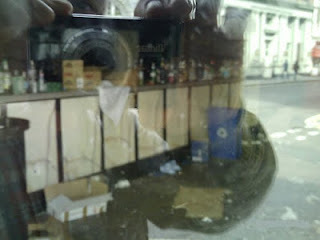 This stylish bar was one of my regular watering holes many years ago. Good food served upstairs and cruisy and dark in the small downstairs bar. The walls used to have plaster figures of naked men’s torsos set into them and no chairs at all. It was very much a vertical drinking establishment and was usually packed by closing time. It had a very varied clientele, notably black, latino and Chinese. Situated conveniently close to Heaven, they also sold queue-jump tickets. Extremely convenient when you consider the length of the queue to get into heaven. Things began to go downhill when the narrow dark passageway at the back of the tiny dance floor was illuminated and had a cloakroom installed. All sorts of nefarious things went on in there! The racial politics were interesting to observe too. At the end where the dark passageway was, the Afro-Caribbean men used to gather. African men generally stood by the bar and the Chinese men tended to stay upstairs as the night progressed. One night, I was in there early on and the downstairs bar had just been opened. There were a handful of Chinese boys dancing in front of the large video screen to Kylie videos. The VJ then turned on an R&B track and a clutch of young black boys dashed out from the dark passageway where they had been hiding and began dancing energetically around the Chinese boys, who fled upstairs and never came back! In later years, they turned it smoke-free even before the wretched smoking ban came into force, turned the lighting up downstairs and filled it with elaborate and frou-frou furnishings, including a baby grand piano. The sexual buzz of the place had been completely destroyed and I felt uncomfortable there. In fact, now I think about it, I wanted to drop in for a pint at the end of January (2012) and it was closed for refurbishment at that time. I will try and get a reading done in whatever fills the chaotic space I saw on Sunday, but it won't be the same.